Astronomers have discovered a "weird and freakish object" resembling a rotating lawn sprinkler in the asteroid belt between Mars and Jupiter. The find, reported online in the Nov. 7 issue of the Astrophysical Journal Letters, has left them scratching their heads and searching for an explanation for the strange asteroid's out-of-this-world appearance. Normal asteroids appear simply as tiny points of light. 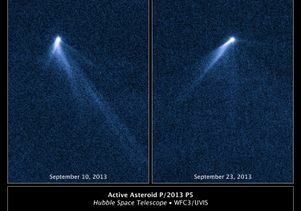 This bizarre asteroid has six comet-like tails of dust radiating from it like spokes on a wheel. "It's hard to believe we're looking at an asteroid," said lead investigator David Jewitt, a professor in the UCLA Department of Earth and Space Sciences and the UCLA Department of Physics and Astronomy. "We were dumbfounded when we saw it. Amazingly, its tail structures change dramatically in just 13 days as it belches out dust." One interpretation is that the asteroid's rotation rate increased to the point where its surface started flying apart, ejecting dust in episodic eruptions, starting last spring. The team has ruled out a recent asteroid impact scenario because a large quantity of dust would have been blasted into space all at once. This object, designated P/2013 P5, has ejected dust for at least five months, Jewitt said. The asteroid was first seen as an unusually fuzzy-looking object with the Pan-STARRS survey telescope in Hawaii. Its multiple tails were discovered in images taken by NASA's Hubble Space Telescope on Sept. 10, 2013. When Hubble returned to the asteroid on Sept. 23, its appearance had totally changed; it looked as if the entire structure had swung around. "We were completely knocked out," said Jewitt. The tails could have been formed by a series of "impulsive dust-ejection events," modeling by team member Jessica Agarwal revealed. Agarwal, of the Max Planck Institute for Solar System Research in Lindau, Germany, calculated that the first ejection event occurred on April 15 and the last one on Sept. 4. The intervening eruptions occurred on July 18, July 24, Aug. 8 and Aug. 26. Radiation pressure from the sun smears out the dust into streamers. The asteroid could possibly have been spun up if the pressure of sunlight exerted a torque on the body, Jewitt said. If its spin rate became fast enough, he said, the asteroid's weak gravity would no longer be able to hold it together. Dust might avalanche downslope toward the asteroid's equator and eventually drift into space to make a tail. So far, only a small fraction of the asteroid's main mass — perhaps 100 to 1,000 tons of dust — has been lost, Jewitt said. The 700-foot-radius nucleus is thousands of times more massive. Follow-up observations may reveal whether the dust leaves the asteroid in the equatorial plane; if so, that would indicate a "rotational breakup," Jewitt said. This must be a common phenomenon in the asteroid belt, Jewitt said, and may even be the main way in which small asteroids die. "In astronomy, where you find one, you eventually find a whole bunch more," he said. "This is an amazing object and almost certainly the first of many more to come." The object may be a piece from an asteroid collision that occurred roughly 200 million years ago, Jewitt noted. The resulting collision fragments, known as the Flora asteroid family, are still following similar orbits. Meteorites from these bodies show evidence of having been heated to as much as 1,500 degrees Fahrenheit. 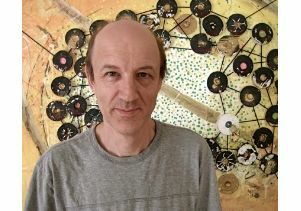 Jewitt, who is a faculty member in the UCLA College of Letters and Science is a member of the National Academy of Sciences and a fellow of both the American Association for the Advancement of Science and the American Academy of Arts and Sciences. He played an instrumental role in the 1993 discovery of the Kuiper Belt beyond Neptune. The discovery of the Kuiper Belt, which contains more than a billion objects and was once believed to be empty space, has fundamentally changed the modern perception of the solar system. Co-authors of the current research are Jessica Agarwal (Max Planck Institute), Harold Weaver (Johns Hopkins Applied Physics Laboratory), Max Mutchler (Space Telescope Science Institute) and Stephen Larson (University of Arizona). The research is funded by NASA. For images and more information about P/2013 P5, visit http://hubblesite.org/news/2013/52. For information about the Hubble Space Telescope, visit http://www.nasa.gov/hubble. The Hubble Space Telescope is a project of international cooperation between NASA and the European Space Agency. NASA's Goddard Space Flight Center in Greenbelt, Md., manages the telescope. STScI conducts Hubble science operations and is operated by the Association of Universities for Research in Astronomy Inc., in Washington, D.C.
UCLA is California's largest university, with an enrollment of more than 40,000 undergraduate and graduate students. The UCLA College of Letters and Science and the university's 11 professional schools feature renowned faculty and offer 337 degree programs and majors. UCLA is a national and international leader in the breadth and quality of its academic, research, health care, cultural, continuing education and athletic programs. Seven alumni and six faculty have been awarded the Nobel Prize.